Lindsay McKinnon is a Midwife of Souls and a Vessel for holistic healing, guiding individuals and communities through inspiration and action to connect, heal, and amplify their lives. As a Youth Minister she led retreats and pilgrimages to create personal encounters with Spirit through rituals, service opportunities, workshops and intentional conversations. As a Massage Therapist, Bodyworker and Childbirth Doula for over twenty years, Lindsay passionately stands for the human spirit’s capacity for creation and having the courage to heal and expand, literally and metaphorically, while working with our bodies as Vessels. As a Qoya Teacher she has lead retreats around the world. She loves connecting women to their body-temples through movement, allowing space for the full expression of the Divine living inside each and every one of us, while infusing ritual and ceremony into a celebration of the sacred feminine. Her writings and lectures offer both wisdom to soothe the aching soul, and empowerment to take action in our lives and communities. You can find Lindsay gathering with friends on her front porch for sunset, swinging at the playground with children, dancing on the beaches of Costa Rica, marinating in the people, animals and landscapes of Zimbabwe, or adventuring across the US in her teardrop camper, spreading love and being of service wherever her wanderlust takes her. My “story” is no story. It is my life though, and it’s mine to live in the best way I know how with the best tools I know to use, in service of the best intentions I know to pray for. I am here to Love and Serve. I have known this since my high school days when my life as a “retreat junkie/spirit junkie” first began, attending, staffing and designing church retreats. I travelled nationally as a competitive gymnast, and my love for travel and adventures on the road has only grown since those days. Being an athlete taught me how to listen and take care of my body in a certain way though, and laid the perfect foundation for me to learn more about this as I grew older, learning new ways of listening even deeper, and practicing new rituals of self care. My spiritual life was always being fed by the various communities I invested my time and attention into. I fell in Love, got married and had two of the most incredible children that were the absolute Light of my life. I shifted from working as a Youth Minister in churches to bodywork as a Massage Therapist and Childbirth Doula. I met God in the body-temples of every client I touched, and in every Mother and Baby bringing forth life with their Breath and Being. My hands were, and continue to be, in constant prayer. I am in awe of the vulnerable places I have met humans when they allow their humanity and Divinity, to intersect and lead, simultaneously. My children were the beneficiaries of the fun-loving presence of the Divine fueling every adventure of every day. Together with my husband, we raised our Boys with the values and consciousness that we were afforded through rich experiences in various communities. I continued to dance, and we often danced together as we cooked dinner in the kitchen or as I shuffled them to activities after school. Dance became one of our common languages, and also a direct pathway to experience the Divine moving through us and each other as we shared in those dances – literally and metaphorically. 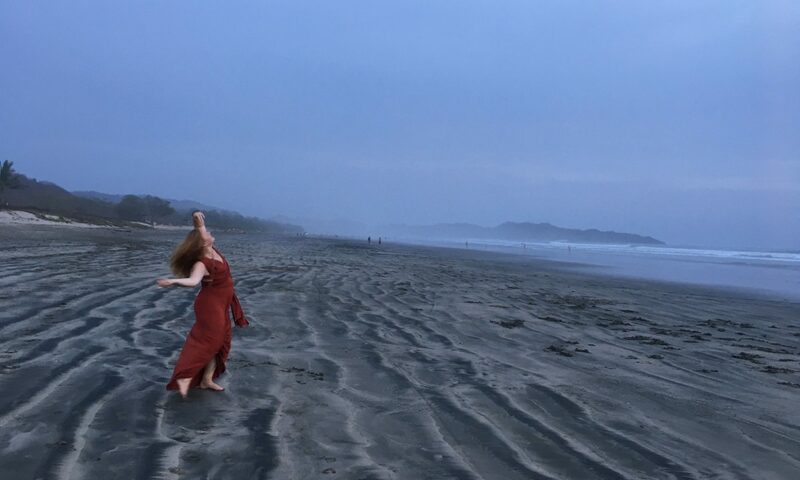 I became a Qoya Teacher and have used the framework of those principles to infuse into our lives: 1 – life is a dance, 2 – there’s no way you can do it wrong and the way you know you’re doing it right is that it feels good. More important than good, it feels honest and true, and 3 – everything you are looking for is found within. These principals in Qoya, in addition to my faith foundation, were essential to me when my life changed drastically overnight and tragedy hit our family and home, blindsiding us, and our entire community. In the middle of the night our house caught on Fire, and within moments we lost everything we had ever known, everything that had meaning and purpose, and everything that had identified us as the American family living the dream. Our Boys died in that Fire, and life as a grieving, bereaved parent has never been the same since. We were rushed to the Burn Unit in a city two hours away as the news hit our town and hit hard, with a ripple effect that renders one speechless. I became a childless Mother, homeless, shoeless, and from the smoke inhalation damage, without a voice. I did have Community though, I had my Faith, and my Body. Broken in every way, my husband and I experienced a massive outflow of love and generosity from others. Hard lessons in receiving gifts were painfully beautiful, and again, God met us in every person, every landscape and Being we met. With no attachments to home or the things one fills a home with, we learned how to navigate our grief while traveling internationally and domestically. In doing so, we encountered how others also navigate grief, what is most essential in life, and how important it is to take care of one another, seeing, meeting, and responding to the Divine within. A year and a half post-Fire, and much to our surprise, we were gifted from Beyond with a pregnancy and the coming of our third child. After the shock and awe wore off, we re-focused our efforts on rebuilding our infrastructure for our Baby, bought a house, and two weeks after moving into that house, welcomed a beautiful Baby Girl into our midst. She has been blessing us ever since. We have learned to feel all the feels and have embraced the depths of those feelings with unwavering willingness to actually feel them. We have learned to hold space for others while holding space for ourselves. We have learned that healing comes in many forms and is a constant practice, as is grief. We have learned how essential self care is, and that it is a discipline, and certainly NOT a luxury. We have learned to create boundaries and to speak into vulnerable moments that are raw, sometimes scary, and that are best navigated with transparency. We have learned that we can do the hard things when met with Grace and compassion. We have learned how to create form out of the formless, magic out of ashes, and more Love out of the most painful heartache. I would love to teach you how.